This sentimental longing for the newspaper is one that can be seen and felt today as Americans across the nation watch major publishers close their doors, file for bankruptcy or switch to electronic editions only. Since 2006, the circulation of the nation’s daily newspapers has plummeted in one of the sharpest declines in history. Newspaper advertising revenue dropped 29 percent in the second quarter of 2009 and the numbers have only continued to decline. In the 21st century, Americans view the dying newspaper as a recent dilemma: a direct result of the technological explosion of the Internet, and consumer need for instant gratification in the so-called information age. But perhaps the contemporary threat of extinction is the same fear expressed by E. B White and his generation over 60 years ago. Has the newspaper format really been dying all these years? Or is this the continuous anxiety all Americans feel as technology and time changes their desires and needs? In the 1920s, there were about 17 New York City newspapers in general circulation. For White, the drastic loss of newspapers was felt as this number dwindled down to 10 in 1949. Much of this change was due to Frank Munsey, a newspaper and magazine publisher known for creating and using high-speed printing presses to mass produce newspapers made of untrimmed, pulp paper. Aimed at working-class readers, these ‘pulp magazines’ became a lucrative industry for Munsey, who would terminate existing papers just to start new ones in their place. When newspapers were not being shut down they were being compressed and combined. In 1924 The Evening Globe merged with The Evening Sun. One year later, The Herald and The Tribune combined to make the Herald Tribune. Newspapers were constantly shifting and New Yorkers were forced to change their daily routines of news consumption with each merger. Today there are even fewer newspapers in New York than when White lived; however, instead of reincarnation by merger, newsprint is simply succumbing to the immediacy of internet sources. Perhaps someday soon, news in pulp form will be a thing of the past, and the omen that newspapers are dying, will finally come true. Bechet, Sidney and Johnson, Bunk. (1945). Days beyond recall. On Sidney Bechet, 1945-1946 [CD]. Portland, Oregon: Allegro Corporation (Originally recorded by Blue Note Records). Bernhard, N. (2003). “Let Munsey Kill It!”: The Birth of the Newspaper Chain (1900s). In J. S. Baughman, V. Bondi, R. Layman, T. McConnell, & V. Tompkins (Eds. ), American Decades. Detroit: Gale. Retrieved from: http://ic.galegroup.com:80/ic/bic1/ReferenceDetailsPage/ReferenceDetailsWindow?displayGroupName=Reference&disableHighlighting=false&prodId=BIC1&action=2&catId=&documentId=GALE%7CEJ2113101505&userGroupName=nypl&jsid=577dfb7238ed7bf1f002dece6c766905. Editor and Publisher International Yearbook (2012). Number of Daily Newspapers [Data File]. Retrieved from Newspaper Association of America: http://www.naa.org/Trends-and-Numbers/Circulation/Newspaper-Circulation-Volume.aspx. Flickr. New 11.6 MacBook Air [photograph]. Seigler, M.G., photographer. (2010, October 20). Retrieved from: http://www.flickr.com/photos/parislemon/5100280516/. Gale Group (2011). “Newspapers: Publishing, or Publishing and Printing.” Encyclopedia of American Industries, Online Edition. Reproduced in Business and Company Resource Center. Retrieved from: http://galenet.galegroup.com/servlet/BCRC. Gillin, Paul (2012). Newspaper Death Watch. Retrieved from:http://newspaperdeathwatch.com/. Neiva, Elizabether MacIver (Spring, 1996). Chain Building: The Consolidation of the American Newspaper Industry, 1953-1980. In The Business History Review Vol. 70, No. 1, pp. 1-42 . Retrieved from: http://www.jstor.org/stable/3117218\. The New York Times Company. (1991). In A. Hast (Ed. ), International Directory of Company Histories (Vol. 4, pp. 647-649). Chicago: St. James Press. Retrieved from http://ic.galegroup.com:80/ic/whic/ReferenceDetailsPage/ReferenceDetailsWindow?displayGroupName=Reference&disableHighlighting=false&prodId=WHIC&action=2&catId=&documentId=GALE%7CCX2840800221&userGroupName=nypl&jsid=acb70736cc2527a3a31d0d210e5d588c. Newspaper Association of America (2012, March 14). Advertising Expenditures: Annual (All Categories) [Data File]. Retrieved from Newspaper Association of America: http://www.naa.org/Trends-and-Numbers/Advertising-Expenditures/Annual-All-Categories.aspx. Park, Robert E. (Nov., 1923). The Natural History of the Newspaper. American Journal of Sociology, Vol. 29, No. 3, pp. 273-289. Retrieved from: http://www.jstor.org/stable/2764232?seq=1. Prelinger Archives. 17 Days: The Story of Newspaper History in the Making [motion picture]. New York Daily News, sponsor. (1945). Retrieved from: http://archive.org/details/17DaysTh1945. Prelinger Archives. Countdown Leader [motion picture]. Technicolor Corporation. (1960). Retrieved from: http://archive.org/details/Countdow1960. Prelinger Archives. Journalism [motion picture]. Holmes (Burton) Films, Inc., producer. (1940). Retrieved from: http://archive.org/details/Journali1940. Prelinger Archives. Manhattan Waterfront [motion picture]. Van Beuren Productions, producers. (1937). 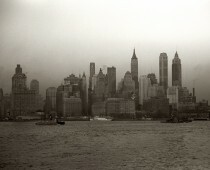 Retrieved from: http://archive.org/details/0503_Manhattan_Waterfront. Prelinger Archives. Third Avenue El [motion picture]. Davidson, Carson, producer. (ca. 1950’s). Retrieved from: http://archive.org/details/ThirdAve1950. Rayman, Graham (2009, Sep 29). How New York City’s seven newspapers are (nearly) surviving. The Village Voice. Retrieved from: http://www.villagevoice.com/2009-09-29/news/how-new-york-city-s-seven-newspapers-are-nearly-surviving/. Wikimedia Commons. New York City, New York. Miscellaneous (Young man selling newspapers) [photograph]. Partridge, Rondal, photographer. (1938, May). Retrieved from: http://commons.wikimedia.org/wiki/File:New_York_City,_New_York._Miscellaneous._%28Young_man_selling_newspapers.%29_-_NARA_-_532246.tif. Wikimedia Commons. Frank Munsey [photograph]. Bain News Service, publisher. (1910, September 16). Retrieved from: http://commons.wikimedia.org/wiki/File:Frank_Munsey.jpg. Wikimedia Commons. Texting [photograph]. Alton, photographer. (2007, December 21). Retrieved from: http://commons.wikimedia.org/wiki/File:Texting.jpg. White, E.B. (1949). Here is New York. New York: Harper & Bros.
Yale University Library. TWA Terminal, Idlewild Airport [photograph]. Eero Saarinen Collection. (1962). Retrieved from Design Observer.com: http://places.designobserver.com/feature/modern-architecture-for-the-american-century/13968/.